MATE creates a filterable tree based on information contained in frames that share some relationship with information obtained from other frames. The way this relationships are made is described in a configuration file. The configuration file tells MATE what makes a PDU and how to relate it to other PDUs. MATE analyzes each frame to extract relevant information from the "protocol" tree of that frame. The extracted information is contained in MATE PDUs; these contain a list of relevant attributes taken from the tree. From now on, I will use the term "PDU" to refer to the objects created by MATE containing the relevant information extracted from the frame; I’ll use "frame" to refer to the "raw" information extracted by the various dissectors that pre-analyzed the frame. For every PDU, MATE checks if it belongs to an existing "Group of PDUs" (Gop). If it does, it assigns the PDU to that Gop and moves any new relevant attributes to the Gop’s attribute list. How and when do PDUs belong to Gops is described in the configuration file as well. Every time a Gop is assigned a new PDU, MATE will check if it matches the conditions to make it belong to a "Group of Groups" (Gog). Naturally the conditions that make a Gop belong to a Gog are taken from the configuration file as well. Once MATE is done analyzing the frame it will be able to create a "protocol" tree for each frame based on the PDUs, the Gops they belong to and naturally any Gogs the former belongs to. How to tell MATE what to extract, how to group it and then how to relate those groups is made using AVPs and AVPLs. Information in MATE is contained in Attribute/Value Pairs (AVPs). AVPs are made of two strings: the name and the value. AVPs are used in the configuration and there they have an operator as well. There are various ways AVPs can be matched against each other using those operators. AVPs are grouped into AVP Lists (AVPLs). PDUs, Gops and Gogs have an AVPL each. Their AVPLs will be matched in various ways against others coming from the configuration file. MATE will be instructed how to extract AVPs from frames in order to create a PDU with an AVPL. It will be instructed as well, how to match that AVPL against the AVPLs of other similar PDUs in order to relate them. In MATE the relationship between PDUs is a Gop, it has an AVPL as well. MATE will be configured with other AVPLs to operate against the Gop’s AVPL to relate Gops together into Gogs. A good understanding on how AVPs and AVPLs work is fundamental to understand how MATE works. Information used by MATE to relate different frames is contained in Attribute/ Value Pairs (AVPs). AVPs are made of two strings - the name and the value. When AVPs are used in the configuration, an operator is defined as well. There are various ways AVPs can be matched against each other using those operators. another_name= "1234 is the value"
The name is a string used to refer to a "kind" of an AVP. Two AVPs won’t match unless their names are identical. You should not use uppercase characters in names, or names that start with “.” or “_”. Capitalized names are reserved for configuration parameters (we’ll call them keywords); nothing forbids you from using capitalized strings for other things as well but it probably would be confusing. I’ll avoid using capitalized words for anything but the keywords in this document, the reference manual, the examples and the base library. Names that start with a “.” would be very confusing as well because in the old grammar, AVPL transformations use names starting with a “.” to indicate they belong to the replacement AVPL. The value is a string that is either set in the configuration (for configuration AVPs) or by wireshark while extracting interesting fields from a frame’s tree. The values extracted from fields use the same representation as they do in filter strings except that no quotes are used. The name can contain only alphanumeric characters, "_", and ".". The name ends with an operator. The value will be dealt with as a string even if it is a number. If there are any spaces in the value, the value must be between quotes "". The way two AVPs with the same name might match is described by the operator. Remember two AVPs won’t match unless their names are identical. In MATE, match operations are always made between the AVPs extracted from frames (called data AVPs) and the configuration’s AVPs. An AVPL is a set of diverse AVPs that can be matched against other AVPLs. Every PDU, Gop and Gog has an AVPL that contains the information regarding it. The rules that MATE uses to group Pdus and Gops are AVPL operations. There will never be two identical AVPs in a given AVPL. However, we can have more than one AVP with the same name in an AVPL as long as their values are different. data AVPLs that contain information extracted from frames. operation AVPLs that come from the configuration and are used to tell MATE how to relate items based on their data AVPLs. Loose Match: Will match if at least one of the AVPs of each AVPL match. If it matches it will return an AVPL containing all AVPs from the operand AVPL that did match the operator’s AVPs. "Every" Match: Will match if none of the AVPs of the operator AVPL fails to match a present AVP in the operand AVPL, even if not all of the operator’s AVPs have a match. If it matches it will return an AVPL containing all AVPs from the operand AVPL that did match one AVP in the operator AVPL. Strict Match: Will match if and only if every one of the operator’s AVPs have at least one match in the operand AVPL. If it matches it will return an AVPL containing the AVPs from the operand that matched. There’s also a Merge operation that is to be performed between AVPLs where all the AVPs that don’t exist in the operand AVPL but exist in the operand will be added to the operand AVPL. 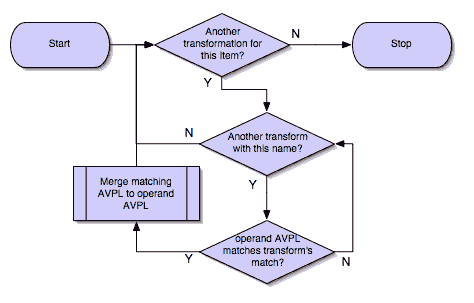 Other than that there are Transformations - a combination of a match AVPL and an AVPL to merge. In the first phase, MATE attempts to extract a MATE Pdu from the frame’s protocol tree. MATE will create a Pdu if MATE’s config has a Pdu declaration whose Proto is contained in the frame. In the second phase, if a Pdu has been extracted from the frame, MATE will try to group it to other Pdus into a Gop (Group of Pdus) by matching the key criteria given by a Gop declaration. If there is no Gop yet with the key criteria for the Pdu, MATE will try to create a new Gop for it if it matches the Start criterium given in the Gop declaration. In the third phase, if there’s a Gop for the Pdu, MATE will try to group this Gop with other Gops into a Gog (Group of Groups) using the criteria given by the Member criteria of a Gog declaration. The extraction and matching logic comes from MATE’s configuration; MATE’s configuration file is declared by the mate.config preference. By default it is an empty string which means: do not configure MATE. The config file tells MATE what to look for in frames; How to make PDUs out of it; How will PDUs be related to other similar PDUs into Gops; And how Gops relate into Gogs. The MATE configuration file is a list of declarations. There are 4 types of declarations: Transform, Pdu, Gop and Gog. MATE will look in the tree of every frame to see if there is useful data to extract, and if there is, it will create one or more PDU objects containing the useful information. 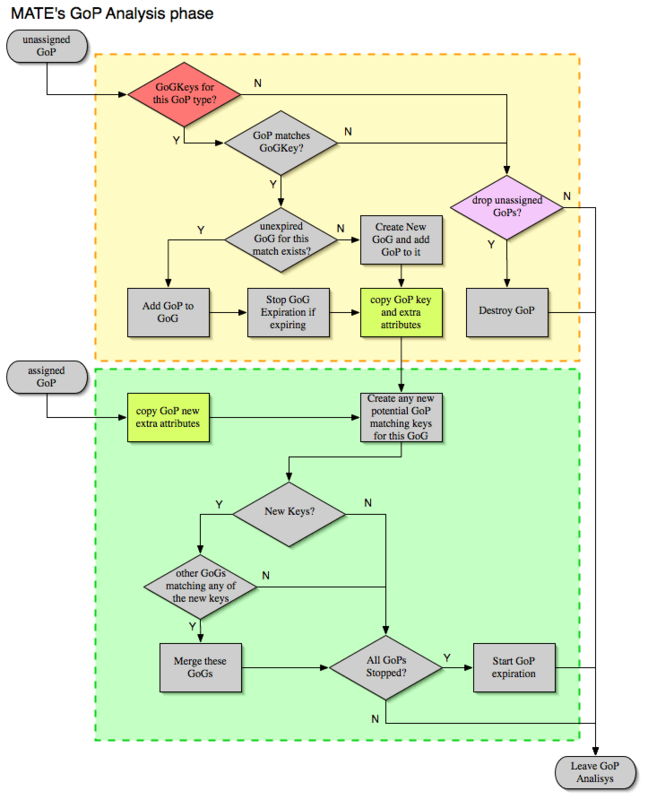 The first part of MATE’s analysis is the "PDU extraction"; there are various "Actions" that are used to instruct MATE what has to be extracted from the current frame’s tree into MATE’s PDUs. MATE will make a Pdu for each different proto field of Proto type present in the frame. MATE will fetch from the field’s tree those fields that are defined in the Section 12.8.1, “Pdsu’s configuration actions” declaration whose initial offset in the frame is within the boundaries of the current Proto and those of the given Transport and Payload statements. MATE will make a Pdu for each different proto field of Proto type present in the frame. MATE will fetch from the field’s tree those fields that are defined in the Section 12.8.1, “Pdsu’s configuration actions” AVPL whose initial offset in the frame is within the boundaries of the current Proto and those of the various assigned Transports. Once MATE has found a Proto field for which to create a Pdu from the frame it will move backwards in the frame looking for the respective Transport fields. After that it will create AVPs named as each of those given in the rest of the AVPL for every instance of the fields declared as its values. Sometimes we need information from more than one Transport protocol. In that case MATE will check the frame looking backwards to look for the various Transport protocols in the given stack. MATE will choose only the closest transport boundary per "protocol" in the frame. This way we’ll have all Pdus for every Proto that appears in a frame match its relative transports. This allows to assign the right Transport to the Pdu avoiding duplicate transport protocol entries (in case of tunneled ip over ip for example). Other than the mandatory Transport there is also an optional Payload statement, which works pretty much as Transport but refers to elements after the Proto's range. It is useful in those cases where the payload protocol might not appear in a Pdu but nevertheless the Pdu belongs to the same category. There might be cases in which we won’t want MATE to create a PDU unless some of its extracted attributes meet or do not meet some criteria. For that we use the Criteria statements of the Pdu declarations. The Criteria statement is given an action (Accept or Reject), a match mode (Strict, Loose or Every) and an AVPL against which to match the currently extracted one. Once the fields have been extracted into the Pdu’s AVPL, MATE will apply any declared transformation to it. The way transforms are applied and how they work is described later on. However it’s useful to know that once the AVPL for the Pdu is created, it may be transformed before being analyzed. That way we can massage the data to simplify the analysis. 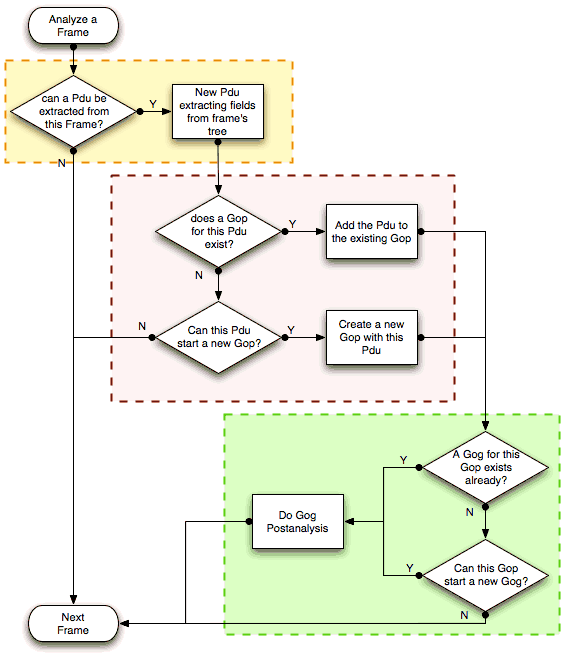 Every successfully created Pdu will add a MATE tree to the frame dissection. If the Pdu is not related to any Gop, the tree for the Pdu will contain just the Pdu’s info, if it is assigned to a Gop, the tree will also contain the Gop items, and the same applies for the Gog level. Once MATE has created the Pdus it passes to the Pdu analysis phase. During the PDU analysis phase MATE will try to group Pdus of the same type into 'Groups of Pdus' (aka *Gop*s) and copy some AVPs from the Pdu’s AVPL to the Gop’s AVPL. Given a Pdu, the first thing MATE will do is to check if there is any Gop declaration in the configuration for the given Pdu type. If so, it will use its Match AVPL to match it against the Pdu’s AVPL; if they don’t match, the analysis phase is done. If there is a match, the AVPL is the Gop’s candidate key which will be used to search the Gop’s index for the Gop to which to assign the current PDU. If there is no such Gop and this Pdu does not match the Start criteria of a Gop declaration for the Pdu type, the Pdu will remain unassigned and only the analysis phase will be done. If there was a match, the candidate key will be used to search the Gop’s index to see if there is already a Gop matching the Gop’s key the same way. If there is such a match in the Gops collection, and the PDU doesn’t match the Start AVPL for its kind, the PDU will be assigned to the matching Gop. If it is a Start match, MATE will check whether or not that Gop has been already stopped. If the Gop has been stopped, a new Gop will be created and will replace the old one in the Gop’s index. If no Start is given for a Gop, a Pdu whose AVPL matches an existing Gog’s key will act as the start of a Gop. Once we know a Gop exists and the Pdu has been assigned to it, MATE will copy into the Gop’s AVPL all the attributes matching the key plus any AVPs of the Pdu’s AVPL matching the Extra AVPL. 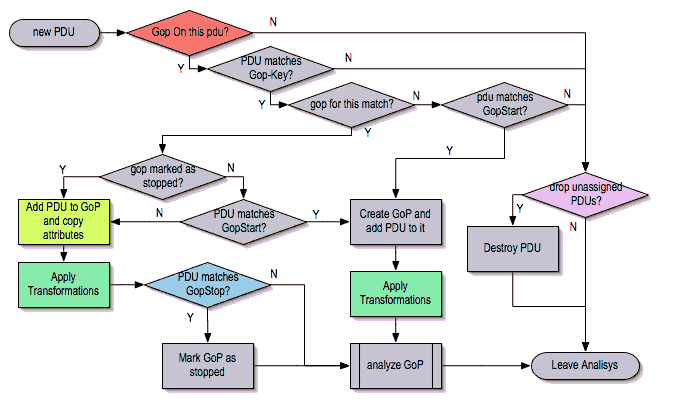 Once the Pdu has been assigned to the Gop, MATE will check whether or not the Pdu matches the Stop, if it happens, MATE will mark the Gop as stopped. Even after stopped, a Gop may get assigned new Pdus matching its key, unless such Pdu matches Start. If it does, MATE will instead create a new Gop starting with that Pdu. If no Stop criterium is stated for a given Gop, the Gop will be stopped as soon as it is created. However, as with any other Gop, Pdus matching the Gop’s key will still be assigned to the Gop unless they match a Start condition, in which case a new Gop using the same key will be created. For every frame containing a Pdu that belongs to a Gop, MATE will create a tree for that Gop. The example below represents the tree created by the dns_pdu and dns_req examples. mate.dns_req which contains the id of this dns_req Gop. This will be present in frames that belong to dns_req Gops. mate.dns_req.dns_id and mate.dns_req.addr which represent the values of the attributes copied into the Gop. mate.dns_req.StartTime time (in seconds) passed since beginning of capture until Gop’s start. mate.dns_req.Time time passed between the start Pdu and the stop Pdu assigned to this Gop (only created if a Stop criterion has been declared for the Gop and a matching Pdu has arrived). mate.dns_req.Duration time passed between the start Pdu and the last Pdu assigned to this Gop. Time, which is defined only for Gops that have been Stopped, and gives the time passed between the Start and the Stop Pdus. Duration, which is defined for every Gop regardles of its state, and give the time passed between its Start Pdu and the last Pdu that was assigned to that Gop. When Gops are created, or whenever their AVPL changes, Gops are (re)analyzed to check if they match an existent group of groups (Gog) or can create a new one. The Gop analysis is divided into two phases. In the first phase, the still unassigned Gop is checked to verify whether it belongs to an already existing Gog or may create a new one. The second phase eventually checks the Gog and registers its keys in the Gogs index. There are several reasons for the author to believe that this feature needs to be reimplemented, so probably there will be deep changes in the way this is done in the near future. This section of the documentation reflects the version of MATE as of wireshark 0.10.9; in future releases this will change. The first thing we have to do configuring a Gog is to tell MATE that it exists. Then we have to tell MATE what to look for a match in the candidate Gops. Most often, also other attributes than those used for matching would be interesting. In order to copy from Gop to Gog other interesting attributes, we might use Extra like we do for Gops. ... (the gop's tree for http_req: 2) ..
... (the gop's tree for dns_req: 1) ..
... (the gop's tree for http_req: 1) ..
mate.http_use.Duration time elapsed between the first frame of a Gog and the last one assigned to it. A Transform is a sequence of Match rules optionally completed with modification of the match result by an additional AVPL. Such modification may be an Insert (merge) or a Replace. Transforms can be used as helpers to manipulate an item’s AVPL before it is processed further. They come to be very helpful in several cases. The name is the handle to the AVPL transformation. It is used to refer to the transform when invoking it later. The Match declarations instruct MATE what and how to match against the data AVPL and how to modify the data AVPL if the match succeeds. They will be executed in the order they appear in the config file whenever they are invoked. The optional match mode qualifier (Strict, Every, or Loose) is used to choose the match mode as explained above; Strict is a default value which may be omitted. the Replace causes all the matching AVPs from the data AVPL to be replaced by the modify_avpl. The modify_avpl may be an empty one; this comes useful in some cases for both Insert and Replace modification modes. (a=aaaa, b=bbbb) gets transformed to (c=cccc, d=dddd) because both a=aaaa and b=bbbb did match. In case of PDU, the list of transforms is applied against the PDU’s AVPL after its creation. In case of Gop and Gog, the list of transforms is applied against their respective AVPLs when they are created and every time they change. A list of previously declared Transforms may be given to every Item (Pdu, Gop, or Gog), using the Transform statement. Every time the AVPL of an item changes, it will be operated against all the Transforms on the list given to that item. The Transforms on the list are applied left to right. Inside each of the Transforms, the item’s AVPL will be operated against the Transform’s Match clauses starting from the topmost one, until all have been tried or until one of them succeeds. Using Transforms we can add more than one start or stop condition to a Gop. MATE was originally written by Luis Ontanon, a Telecomunications systems troubleshooter, as a way to save time filtering out the packets of a single call from huge capture files using just the calling number. Later he used the time he had saved to make it flexible enough to work with protocols other than the ones he was directly involved with.